McKINNON, RANALD, army officer, office holder, and militia officer; b. 1737 on the Isle of Skye, Scotland; m. 20 Nov. 1768 Letitia Piggott, and they had nine children, including John, who became mha for Shelburne County, N.S., in 1823; d. 28 April 1805 in Shelburne. 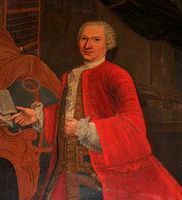 Ranald McKinnon began his career as a lieutenant in the 77th Foot, from 21 Sept. 1758. His regiment served in several North American campaigns during the Seven Years’ War including John Forbes*’s expedition against Fort Duquesne (Pittsburgh, Pa) in 1758 and Jeffery Amherst*’s thrust up Lake Champlain in 1759. McKinnon was apparently present when some of the 77th took part in the recapture of St John’s, Nfld, from the French in 1762 [see Charles-Henri-Louis d’Arsac* de Ternay]. Once the 77th was disbanded in 1763 McKinnon went on half pay, and some time afterwards he accompanied a party of surveyors to southwestern Nova Scotia, where they were to lay out land grants for New England settlers already there. McKinnon liked the area; with a good war record, he had no difficulty in obtaining on 1 April 1766 a grant of 2,000 acres in a place called Abuptic by the Indians. McKinnon renamed it Argyle, after a district in Scotland, and the name came to be applied to the surrounding region as well. McKinnon was a successful farmer and gardener, possibly using slave labour to tend the orchards and field crops on his land. He also took an active part in community life: he was appointed a customs collector on 11 Nov. 1766, served as a road commissioner, and on 16 July 1771 became a justice of the peace and an officer in the militia. His military service, loyalty to the monarchy, and good relations with those in authority in Halifax were apparently well known. 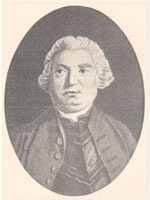 McKinnon was horrified by rumours of rebellion among the New England settlers in Argyle in 1775. American sympathizers within that group seemed ready to foment discord, and they tried to pressure the Acadians in the region to help their cause. But having experienced the distresses of the expulsion in 1755 [see Charles Lawrence*] and a number of them having only been permitted to resettle in Nova Scotia some years afterwards, the Acadians were not about to provoke the British. For their refusal to cooperate they were harassed by the pro-American settlers, who included Jeremiah Frost, a militia captain, and his brother John, a Congregational minister and justice of the peace. Bénoni d’Entremont* and others asked the Council for aid, and as a result Governor Francis Legge* dismissed the Frosts from their positions. Because of Ranald McKinnon’s military experience and his friendly relations with the Acadians, he was appointed commander of the Queens County militia and of the Acadians in Clare Township, and was provided with troops and munitions. The loyalty of the Acadians and some New England settlers, the show of force by the government, and the uncertainty of aid from the rebels across the Bay of Fundy all combined to prevent an active rebellion in southwestern Nova Scotia. 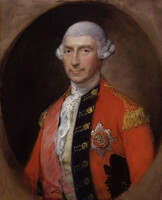 McKinnon’s prompt action in mobilizing the loyalist forces had increased his prestige, and he was appointed a captain in the Royal Highland Emigrants on 14 June 1775. But many of the “neutral Yankees” looked upon the old soldier as an informer, an opportunist, and a Halifax figure-head. McKinnon was alien to them in many other ways: he was an Anglican among dissenters, a customs official among inveterate smugglers, and an aristocrat among levellers. It is not surprising, under the circumstances, that he was physically attacked or that he was beset with lawsuits over land; perhaps more disturbing to him were the threats of barn-burning and cattle-maiming made by his enemies. After his death, his widow found it necessary to seek from the Council confirmation of her rights to the estate, since the ownership papers had been lost or destroyed. As far as can be determined from the available material, Ranald McKinnon’s major contribution to Nova Scotian history was his service as a figure of resistance to pro-American disaffection during a dangerous period of the province’s history. He would have been less successful in his loyalist activities, however, had it not been for the backing of the Acadians. PANS, MG 4, 141 (typescript); RG 1, 212; 226, doc.6. [Jonathan Scott], The life of Jonathan Scott, ed. C. B. Fergusson (Halifax, 1960). Directory of N.S. MLAs. Brebner, Neutral Yankees. G. S. Brown, Yarmouth, Nova Scotia: a sequel to Campbell’s history (Boston, 1888). J. R. Campbell, A history of the county of Yarmouth, Nova Scotia (Saint John, N.B., 1876; repr. Belleville, Ont., 1972). Edwin Crowell, A history of Barrington Township and vicinity . . . 1604–1870 (Yarmouth, N.S., ; repr. Belleville, 1973). Clara Dennis, Down in Nova Scotia: my own, my native land (Toronto, 1934). Jackson Ricker, Historical sketches of Glenwood and the Argyles, Yarmouth County, Nova Scotia (Truro, N.S., 1941). A. A. MacKenzie, “McKINNON, RANALD,” in Dictionary of Canadian Biography, vol. 5, University of Toronto/Université Laval, 2003–, accessed April 22, 2019, http://www.biographi.ca/en/bio/mckinnon_ranald_5E.html.